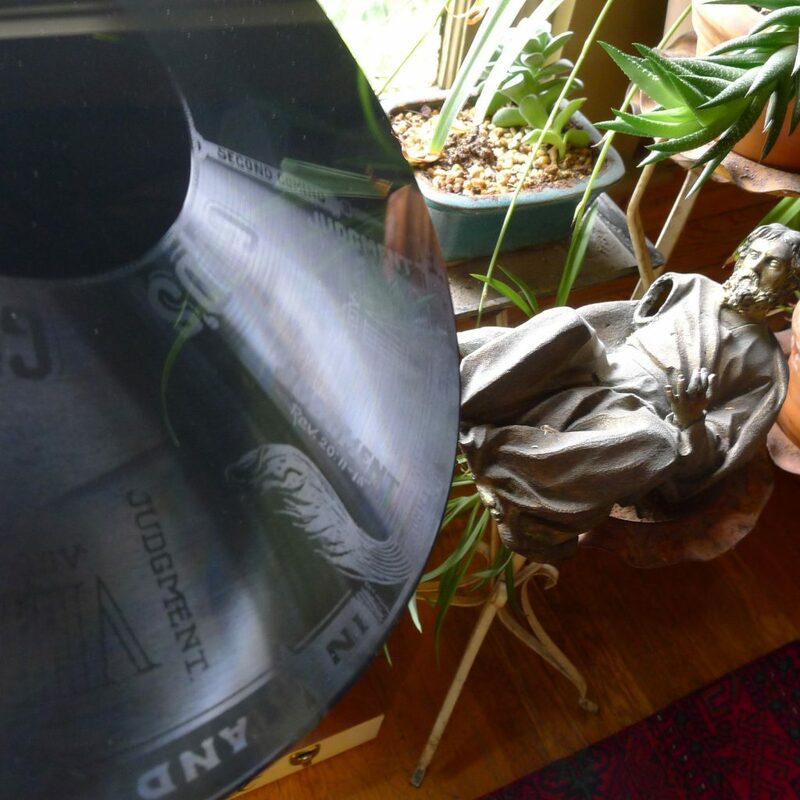 Kris Weston asked me to design some vinyl art for a very interesting record etching process he wanted to use for some fund-raising dub plates, as outlined in these links (1, 2, 3). I some some old, amazing christian eschatological insanity I found while cleaning up my Grandmother’s attic early last year, then Kris sent off some music files and the visual design to Shinsuke and Koji, who then etched some records and sent them to me. 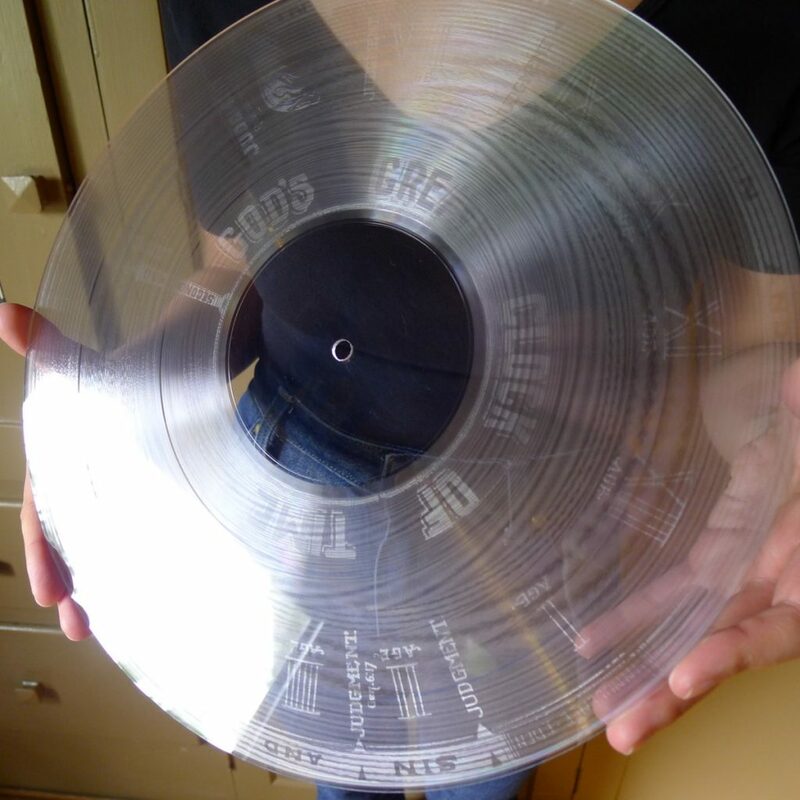 So I suppose these are one-of-a-kind “Thrash” demo LPs (milled into some heavy, very thick material that I don’t think is vinyl), one side of which plays music, the other plays intermittent sine wave beeps and glitches, as informed by the etched artwork. However! After running the app, I feel like there is still some misunderstanding… there is clearly an option to use an audio file instead of a sine wave, and the app asks to save a file when it has been run… AND the audio file is slightly corrupted from the version that was input, meaning that at least something is happening (Unfortunately, even if this redeeming fact turned out to be true, any audible corruption is a deal killer for Kris). So which is it… can the artwork side of the vinyl play music or not? We may not ever find out, because Shinsuke has already been so extremely generous with his time and resources, and since we got to be cringing every time we had another untranslatable question for him… we just don’t want to bother him anymore about it.